LUPO USB 2.0 XD Memory Card Reader For Fuji & Olympus Cameras. Plug and Play auto detection. Catalog #: XTALLCR1. MFG Part #: XTALLCR1. How long does it generally take to process an order?. The manufacturer will generally repair or replace the item so long as it is under warranty. IN THE BOX. Olympus XD picture card reader! New In Box! USB 2.0 Card Reader XD, SD, MS, CF New. Includes: 1 Card Reader per order. Features - Works with windows 7 and up. I got it to work on windows XP after it updated drivers. Will not function for Mac. BULK ORDERS. We usually beat our competition! FIND A LOWER PRICE?. Hawaii, and Alaska. Designed for USB 3.0, this reader is also backwards compatible to USB 2.0 and USB 1.1. In addition. USB 3.0 Cable. Universal Format Compatibility. Quick Install Guide. TWO (2) ADAPTERS PER PKG. Instead of crowding around your PC monitor, show off your latest digital images to friends and families using any TV set with an audio-video input. The rear of the SPA has two USB ports--one that can connect to a PC (enabling you to use the SPA as an 8-in-1 card reader/writer) and another that can host a portable USB flash drive such as a SanDisk Cruzer Mini, Cruzer Micro, or Cruzer Titanium. WE WILL BE HAPPY TO WORK OUT ANY PROBLEMS/ISSUES RELATING TO YOUR ORDER. Works with Mac and Windows computers. USB powered. Power Source. FCC, CE mark. Emission (EMI). ‣ Video Cards. Supported OS. Transparent Charcoal Black. Part Number: FP37B. To make integration of FP37 more seamless, both black and silver colored front bezels are included. Manufacturer: SILVERSTONE. Full support for SDXC card. Hi-Speed USB 2.0 certified for fastest data transfer. Backwards compatible with all USB 1.1 ports. WE WILL BE HAPPY TO WORK OUT ANY PROBLEMS/ISSUES RELATING TO YOUR ORDER. About the item: This item is associated with the following MPN(s): SDDR-91-A15, SDDR-91-07. Silicon Power USB Multi Card Reader. Compact USB 3.0 Card Reader which is compatible with. Compatible with all versions of SD/HC, MiroSD, CF, XD, MS/PRO & Duo cards. "Capture the spot ". High speed USB. All-in-1 Card Reader/Writer. Specs Card. MAC & PC System Compatibility. Rapid data transfer. 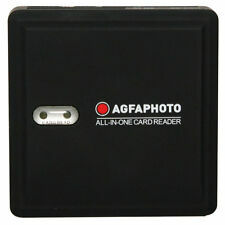 The ImageMate 12 in 1 Card Reader/Writer is a Hi-Speed USB 2.0 Multi-card Reader/Writer that connects to your computer's USB 2.0 port. SD SecureDigital Card & SDHC. CompactFlash Type II. WE WILL BE HAPPY TO WORK OUT ANY PROBLEMS/ISSUES RELATING TO YOUR ORDER. 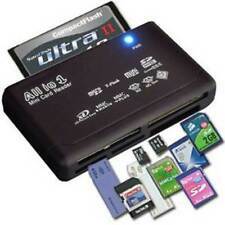 NOTE BEFORE BUYING THIS ITEM ---- PLEASE READ THE DESCRIPTION Ex-Pro® MASD-1 microSD/TF to XD Card Adapter Adaptor. MicroSD Attachment can be used for Olympus Mju-840, 850SW, 1010, 1020, 1030SW and all AW08, SS09, AW09 models ONLY - IT DOES NOT FIT ANY OTHER OLYMPUS CAMERAS OR ANY FUJI CAMERAS - if you buy it for anything other than listed.... you will WASTE YOUR MONEY RETURNING IT.... it will NOT function. Adds support to these cameras for using 4Gb cards (providing firmware is updated) - can be used for pictures or recording video. Extends the continuous recording time from XD cards which only go to 2Gb, not 4 or 8Gb. Note that files can not exceed 2Gb as your camera does not understand data over that size. Offload large files, such as high-res RAW images, 4K, 2K & 3D videos, quickly and efficiently at speeds up to 500MB/s (10x faster than USB 2.0)! Manufacturer: Delkin. Transfer Data at Speeds up to 500MB/s (10x Faster than USB 2.0).